Santa’s had a long and bumpy road on his way to becoming a modern icon, but now that he’s here he doesn’t look likely to leave anytime soon. In a world that so often lacks any magic, Santa provides a doorway into a realm of imagination and wonderment. A world without Santa is a world I don’t want to live in. We share so little myth these days, and what myth we do share rarely transcends religious boundaries, but Santa is different. With his origins in Greek myth, Catholic tradition, Norse paganism, and the wilds of the human imagination, he’s capable of not just magically jumping down chimneys, but of jumping into the hearts of whoever will have him. I commented on another blog post today, on my position on “The Santa Debate”. As in, whether or not “doing Santa” as part of one’s family traditions is a good idea or not. Interested in the sorts of comments on a mostly Christian blog, I felt compelled to ask about “doing Santa” on the blog’s Facebook pagan, and asked: Do you do Santa? Is he “Pagan too” (I love that song)? Or do you consider Santa to be “lying”? Or do you maybe do something else (like we do the Yule Faeries)? I got some really interesting answers. I understand the concern of lying, by perpetuating the idea that jolly fat man rides around in a plush scarlet velvety suit pulled by flying reindeer and managing to deliver gifts to all of the world’s children in a single night (but I tend to think that its not a big deal). I mean, the sheer physics of that are very unlikely. But it seems that a number of people also had problems with the “naughty or nice” thing as some sort of bribery/punishment thing. Also, I saw that even in some families that chose not to “do Santa”, that their kids picked it up from school anyhow and (even in families where they were told that Santa wasn’t real) children often chose to believe intentionally (a variation of this has occurred in our home too). My answer though, in comments on the blog post, was that, in our family, we believe in the sacredness of stories (I’ve talked about this before around here). Mythos is incredibly important to the human experience, whether it be the mythology of hundreds of thousands of religious traditions or the mythology of folk tales. Myth is the collective search of humanity for truth, meaning and significance in the experience of life, so that it resonates beyond the merely physical (and short) time that we are alive into something more. We’ve been teaching our children for as long as they’ve been alive that it is the spirit of the story that is important, not how literal it is or is not–whether it be Tolkien, the Nativity, or the Oak and the Holly King. Santa doesn’t need to be literal to be REAL. Santa isn’t a jolly fat man in a red suit, he’s the human conception of the spirit of generosity, built upon generations of myth–from stories and images historical characters as varied as Nikolaos of Myrna from to the Norse and Germanic god, Odin. Honestly, he’s probably the best part about the holiday, because he’s accessible to everyone, regardless of religion (and ethnicity–don’t even get me started over the Faux “News” debacle over the race of Santa). I believe in Santa. Actually, I believe in hundreds–no, thousands of Santas, all around the world. People that embody the spirit of a jolly fat man in a velvety red suit, to bring job to children. People that take the extra time at Christmas, or even all year round. People like this, and this, and this, and this. Bottom line: Santa is one helluva awesome myth to believe in. Even though he doesn’t deliver our presents–too busy getting ready for Christmas. He has his little winged friends, the Yule Faeries do it! Okay, so I’m couple days early…but we started our Yule celebration yesterday, and will keep going for 12 nights. So Merry Yule it is! Night 1–Talk about axial tilt. So, I found this adorable “Axial tilt is the reason for the season” meme… But silly meme’s aside, its true! We have a solstice because the earth is tipped to the side. So, for the first night, we talk about the science behind the season. This is also when we slice oranges to hang on the tree to dry. Night 2–Talk (in a general sense) about how and why different cultures celebrate the Winter Solstice, and some of the similar themes prevalent in the holiday. Read Winter Solstice by Ellen Jackson. String cranberry wreaths. Night 3–Talk about balance and equilibrium and the Dongzhi Festival, the Chinese celebration of the Winter Solstice. Eat dumplings, string popcorn blessing garland. Night 4–Talk about Winter and what winter meant for our ancestors, how winter was a challenge in terms of finding food, keeping warm, of the importance of light in a dark world. Talk about Beiwe and her mythology (Beiwe is the Sami goddess of the Sun). Keep all electronics off, candle light only. Night 5–Talk about the importance of the Sun to the Earth, and to us. Talk about how ancient peoples watched where the sun rose and set to know where they were in the year. Talk about Stonehenge and Newgrange, and other ways that different cultures watched the sun, about the “woodhenge” at Cahokia, about the Hopi tracked the sun using kivas for their celebration of Soyaluna. Make the sun, to go on the tree the next day. Night 6—Go out to dinner and a movie (we are either going to see Frozen or the new Hobbit movie), and return to presents delivered by the Yule Faeries. Make up new Yule Faerie stories! Drink eggnog, eat cookies. Hold the family ritual for Yule and put the sun on the top of the tree. Go to bed for the sunrise beach walk to greet the new Baby Sun King. Night 7–Talk about hope, light, respecting others, and the holidays of Diwali and Hanukkah (even though both were in November this year). Read the story of Tante Golda in The Miracle of the Potato Latkes and the story of the latke in Lemony Snicket’s The Latke Who Couldn’t Stop Screaming. Eat latkes. Night 8–Talk about how the Winter Solstice is celebrated in the Southern Hemisphere (during our summer), and the festivals of We Tripantu and Inti Raymi, and about how the Summer Solstice is being celebrated (now) in the Southern Hemisphere. Night 9–Talk about Christmas and the mythology of Jesus. Put up the nativity set. Listen to Handel’s Messiah (because its beautiful). Make a gingerbread house. Night 10–Talk about Saturnalia, Mithra, and Sol Invictus (the Roman and Romanized holidays). Celebrate. Let Misrule (the kids) try their hand at Rule for the evening. Night 11–Talk about our roles as individuals as humans in a wider, global, human community. Talk about Kwanzaa, and the principles of Kwanzaa. Discuss our roles and principles as a family. Night 12–Reflect on the holidays, personally, and as a family. Consider the upcoming New Year. Lets face it, Humanity is on a funky sort of of feedback loop–change is inevitable and progressive, but the struggle is eternal. 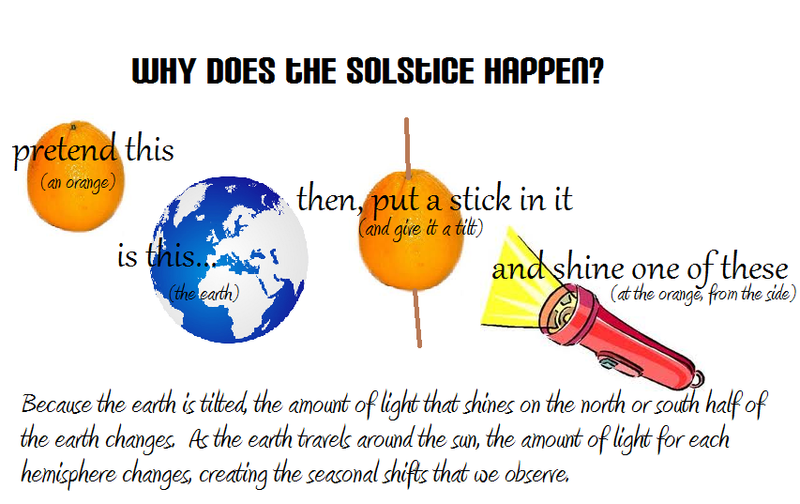 Which is why the Solstice matters. Billions of years ago (14 actually), something happened. Something that might have been special, that might have been miraculous…or it could have actually been pretty darn routine. Its hard to say though, since none of us were here (or there) and we lack the capacity to see quite that far yet. But, either way, in the beginning, a giant explosion hurled existence into being and set forth events that would lead to us. Our Sun (a pretty average sort of star), was born from some of the matter ejected in this explosion. One of many, many swirling clouds of matter contracted under its own weight, spinning* itself into the shapes we know today as the Sun and its solar system. It didn’t happen overnight–the sun’s formation took about 9 billion years (that is one heck of a pregnancy! ), and in its birthing, the “extras”, the left over material that had formed in bands around the developing proto-Sun, conglomerated into the planets…including Earth. The Solstices (and Equinoxes) celebrate the cycle of the Earth’s journey around the Sun, journey that is mimicked in our own lives, in Humanity, and by the Sun itself. There is no Baby Sun King, no Dying Solar God–there is a planet, with a tilt. But the Sun does live…it was born, and it will die, on a timescale that we have no possibility of understanding. Mankind with long have ceased by the time the Sun burns out. In the timescale of the Universe, our Sun is at his peak–midway through its life. We might allegorically celebrate this as the time of the Sun’s rebirth (or the Sun’s height, for those in the Southern Hemisphere), but its really about our rebirth. Our chance to keep fighting the fire of our existence. Our reminder to make this the end of the world as we know it. Because, maybe then, we can keep spinning until we become something better. Change takes time. It took the Sun 9 billion years to be birthed. And the Earth and the Sun working together another 4.5 billion** years to make complex life. 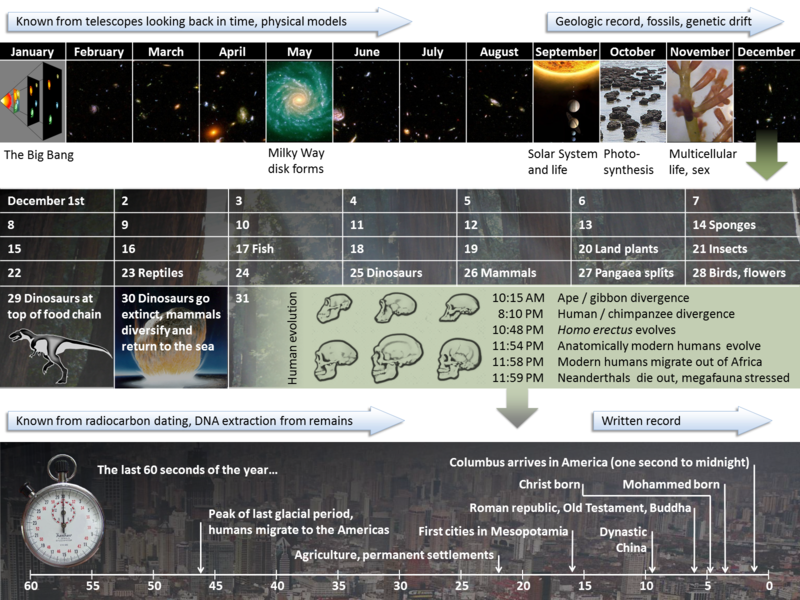 It has taken us, by comparison, 8 million years to evolve*** from our nearest common ancestor with successful descendants. Our species, Homo sapiens, has only been around for 100,000 years, and only in the past 10,000 years did we lay the foundations for the societies of today (through the “invention” of agriculture). Every year, we celebrate the turning of the wheel–the Wheel of the Year, but also of our time, because the former is a microcosm of the latter. We celebrate the Sun, because it is the ultimate giver of life on this planet, whether we take the time and energy to worship it as a solar deity or just respect its plain damn awesomeness. ***…and we are still evolving! Bonus Track: Teach your kids about the Earth’s travels with an orange, a stick, and a flashlight. They were dancing ’round a bonfire, instead. I sprang from the circle to see what was the matter. Peeked in through the windows, and took a great gasp. But eight tiny fairies, with wings so perfectly clear! I knew it was magic they brought on this day. As they laid out each gift in a sparkle of snow. and headed back down to where we were gathered. He has special helpers for the littlest Pagans and Wiccans! 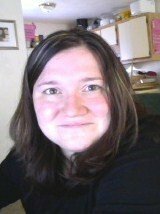 Meet Garnet: You might remember the Sabbat Faeries…but if you don’t, its okay–I can tell you again! You do remember that tonight is The Longest Night, where we celebrate the dying of the Old Sun King and the birth of the Baby Sun King? Tomorrow is what we call Yule, or the Winter Solstice–the time when the Baby Sun King is reborn and the days will start to grow longer again as the Sun gets stronger. A note from Mom: This is where I probably should mention that we don’t normally treat Santa or the Sabbat Fairies as “real”–at least not as “real” as the literal, physical (or otherwise) sort of entity. We don’t lie to our kids. Chickadee would be the first to tell you that Santa is “made up, but that’s ok because he’s still cool” followed up by a “but I’m not supposed to say he’s not real, because it might hurt someone’s feelings” (she’ll probably tell you the same thing about Jesus) (my objection isn’t to her saying he’s either isn’t real, but that she hasn’t learned to do so with much tact yet). But we do tell stories. There is a difference, and even a very small child is capable of understanding that difference. Kids are much better at suspended disbelief than we are. We have always (from the get go) separated the idea of something being “true” from something that contains “Truth”. We follow a belief system seeped in mythology, mythology that is symbolic and allegorical and powerful…but not true. 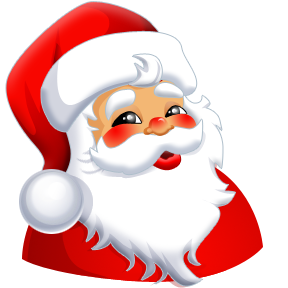 So, for our kids…Santa (and the Sabbat Faeries) are a story, and stories are important.